Monograms are the oldest form of identification in the world, dating back to Greek and Roman times. First used as a form of currency in the barter system, monograms served many roles from indicating social status to serving as a signature for royals and artists. Perhaps most obvious, they identified property and were usually ornate which makes them useful when creating elegant gifts. Traditional, three-letter Victorian monograms are the variety we use most often today. They feature the recipient's first initial, a large last initial, and a middle initial. So Janell Lee Haven's monogram would be JHL and William Edward Smith's would be WSE. If both were single, they would use straight initials for a three-letter monogram such as JLH and WES. Each letter would be the same size. Single monograms for men were typically the first letter of their last name while women used the first initial of their first name. The married couple would use the first initial of the bride's first name, a large first initial of their last name, and a small first initial of the groom's name. After marriage, it is appropriate for the bride to use her maiden name initial as the middle initial. Otherwise, she would use a small first name initial, large surname (married name) initial, small middle name initial. 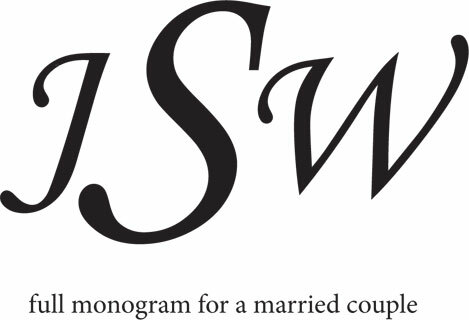 There are several items that make monogramming easy. This program makes arranging monograms and wording easy as can be. There are more than 50 fonts to choose from. Many of Ann's alphabets work with Alphabet Xpress (for club members, they are always half-off!). Check out the video and try it free for 30 days. Favorite monogram blanks include towels, napkins, table linens, pillow cases, and hankies. Three monograms are available in six sizes, with projects, tips, and 28 frames and brackets. Check out the video. Choose from 20 built-in fonts, five monograms, and more than 40 monogram frames.